* The news that the Belgian manager, the compact but ever belligerent Marc Wilmots was affectionately known as "Das Kampfschwein" or "The War Pig" during his playing days in Germany cheered me up this weekend ahead of the big quarter final. It's also the title of my fave Black Sabbath song. The fact that in Belgium, Wilmots was known as The Bull of Dongelberg (after his home town) made it all the sweeter - a double whammy of great nicknames in a World Cup that is sadly bereft of them (if we don't count the Brazilian Hulk). * I've always loved nicknames, especially sporting ones. The best manage to convey the truth - kind or unkind - about a sportsman in the most pithy way imaginable. Some, such as those for boxer Juan "The Hispanic Causing Panic" Lazcano or footballer Kiki "Chris" Musampa will make you smile. Others, such as Sam "The Nigerian Nightmare" Peter, Luis "The Wild Bull of The Pampas" Firpo or Texan Lew "The Sweet Swatter From Sweetwater" Jenkins are a little over the top. And then there are those that give you the idea of how important sportsmen are to the people they represent. Ali was The Greatest. Jack Nicklaus The Golden Bear. The brilliant boxer Manny Pacquiao is such a hero to the people of the Philippines, he is known as "Pambansang Kamao" - The National Fist! However, boxing doesn't have the monopoly on funny, witty nicknames - the disastrous Italian goalkeeper Massimo Taibi - who came to Manchester United from Venice - quickly gained the nickname "The Blind Venetian". Everton legend Duncan Ferguson was known for getting into boozy fights - hence "Duncan Disorderly" while QPR defender Fitz Hall got the pretty imaginative (for footballers) "One Size" (say it before his name). And in a similar vein, Congolese defender Kiki Musampa got christened "Chris" by his Manchester City Team-mates (again, say it before his second name and think of wicker baskets full of puddings). The great, terrifying West Indian cricket bowler Michael Holding was known - for his quiet run up before the awesomely fast delivery - as "Whispering Death". And some sports nicknames are poignant - the pro cyclist Raymond Poulidor had the great misfortune to see his career coincide with those of two of the very best of all time - Jacques Anquetil and Eddy Merckx - because of this accident of timing, his nickname was "The Eternal Second". History's runner-up. 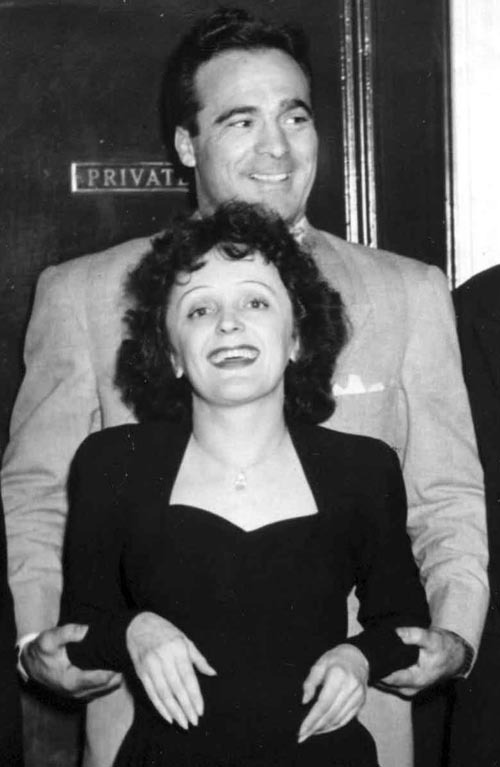 One of my favourite boxers is the great French Algerian World Champ Marcel Cerdan, the tragic lover of singer Edith Piaf, who fought under the moniker of "The Casablanca Clouter" (at least in the US). Cerdan fought Jake La Motta (of Raging Bull fame) for five rounds with a broken shoulder and died in a plane crash en route to a title fight. In the golden era of sports in the '20s and '30s, the great Boxing writers in particular managed to come up with some right doozies (by the way, that word comes from the US car the Duesenberg, the most luxurious, opulent cars of the 1920s and '30s, the tip top, the very best - "it's a Doozy!"). Years ago, I heard of a boxer known as "The Ghost With The Hammer In His Hand" - the brilliant Welsh flyweight Jimmy Wilde. rated by American boxing writer Nat Fleischer, as well as many other professionals and fans including former boxer, trainer, manager and promoter, Charley 'Broadway' Rose, as "the greatest flyweight ever." Wilde earned various nicknames such as, "The Mighty Atom" and "The Tylorstown Terror." But the best for him conveyed in eight words his elusive menace, a boxer you couldn't hit, but who could hit you with the force of a hammer. The era also gave us Primo Carnera - and this is another great nickname - a giant Italian with plenty of heart but all the menace of a marshmallow - Carnera was known as "The Ambling Alp". Brilliant. The most danger the hapless Carnera ever posed to opponents was the threat of accidentally falling over on them. The Gentle Italian Giant was hyped by gangster bookies as the latest in a long line of Great White Hopes, they put him in against patsys - knowing that a Six-Foot-Six Italian would be huge box office in New York and milked him for everything he had. His story inspired the great boxing movie The Harder They Fall, a cynical, noirish 1958 tale of dirty deeds in the boxing business that was Humphrey Bogart's final screen outing. Primo's story also inspired a great pop song - Yeasayer's Ambling Alp. 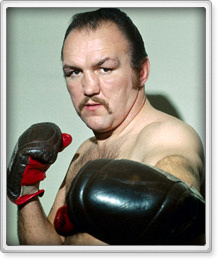 Chuck Wepner was the tough journeyman who had a reputation for bleeding at the lightest touch of a glove - hence the rather cruel nickname the "Bayonne Bleeder". In 1975 he lucked into a fight with Muhammed Ali and went 15 rounds with The Greatest. That particular story inspired Sylvester Stallone to write "Rocky". Quick Chuck! Bleed on 'im! Away from boxing - the story of the great Matthias Sindelar - the tragic hero of Austrian football has always intrigued me - he defied the Nazis after the Anschluss, embarrassed their great Nazi football team in front of a Viennese crowd and was then found dead - either murdered by the Gestapo or by his own hand - shortly afterwards. But I love that his nickname - because of his slight build - was Der Papierene or "The Paper Man". How evocative. These are just a few of my favourite sporting nicknames - it's a subject I may have to return to!